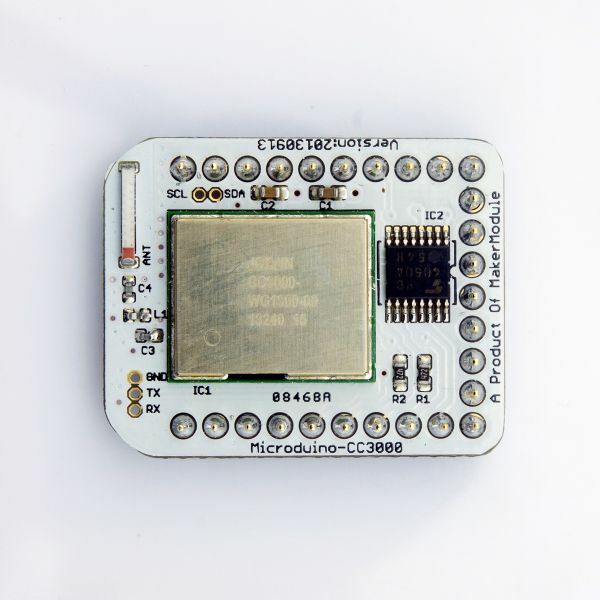 Microduino-CC3000 is a well-equipped wireless network module, which can simplify the implementation of the internet connection. Simple Link Wi-Fi can largely reduce MCU(Micro Controller Unit)'s software requirement of the host machine, making it ideal for using in any low-cost and low-power MCU of embedded applications. Easy to be integrated to pegboards with a 2.45-pitch female header connector interface. Based on Texas Instruments (TI)'s seventh generation Wi-Fi solutions. SimpleLink ™ Wi-Fi SmartConfig ™ technology can ensure a unique and fast activation of Wi-Fi. Developers or end-users could configure the current wireless network through other devices, such as smart phones, tablet PC SmartConfig App program installation. It can configure wireless network information of the current Wifi environment for hardware circuit equipped with CC3000 through the program, including SSID, wireless password, security authentication, and so on. Just one step can it make several devices without display connected to Wifi network and allow people to connect their home network and the Cloud wirelessly. 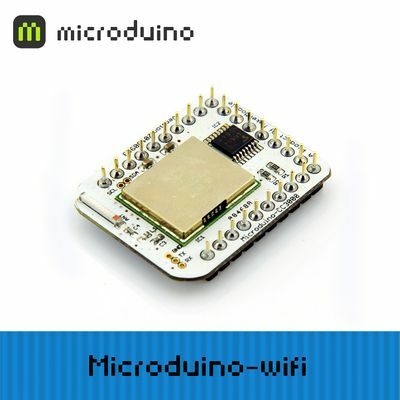 We should know that Microduino-Wifi extension board is used as a slave machine, which communicates with Microduino host machine's SPI. 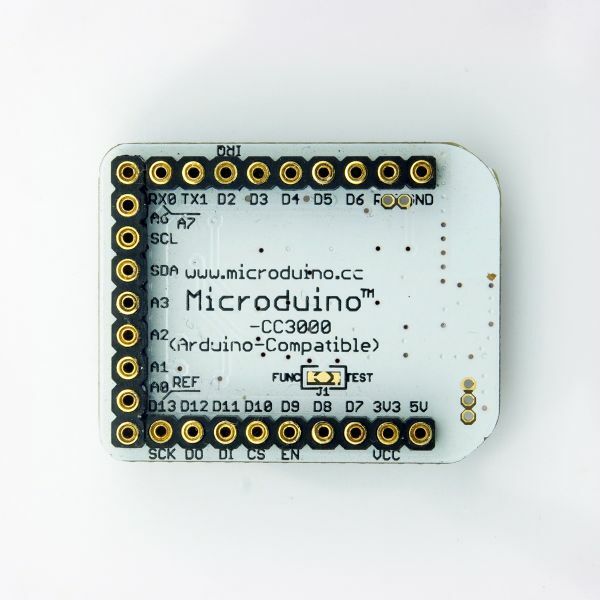 EN 26 D9 Microduino activates CC3000 by setting the pin to high level. Make sure the current(+3.3 v) can reach 200ma. It is not recommended for using FT232R to debug directly since the output current of FT232R is too small. The FT232R datasheet says you can draw up to 50 mA from its 3.3V output. 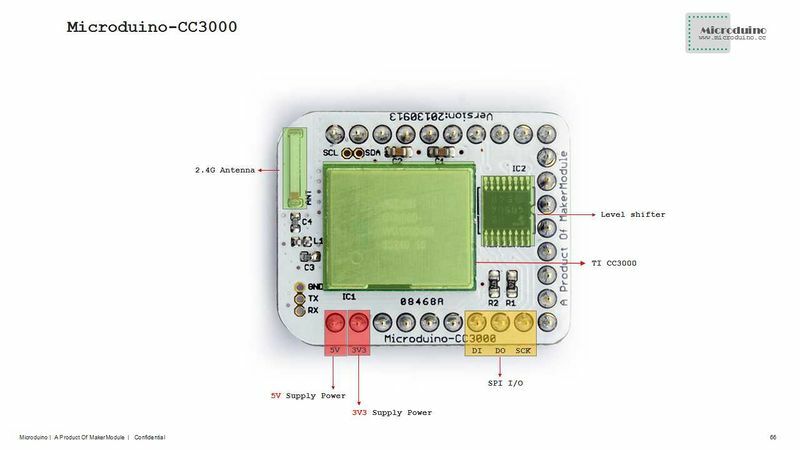 CC3000 patch library is used for upgrading the firmware and can't be activated with Adafruit_CC3000's libray at the same time. Add this “ || defined(__AVR_ATmega1284P__) || defined(__AVR_ATmega644P__) ” after the line. When using CC3000PATCH, please make sure any other cc3000 library should be removed to avoid conflict. And we recommend using "Arduino version 1.01 or higher", if you are using lower version, please re-install it again from zero. Open the serial port monitor（baud rade:115200）till “Waiting for a SmartConfig connection (~60s) ...” shows，just click the "Start" of TI WIFI SMARTCINFIG and wait for the result. Does this module have the antenna? CC3000 module can’t open the webpage, but the “ping” command works. Identify the root cause in software “www.fastrprint (F("GET "));”, how to resolve this issue? This page was last modified on 4 August 2017, at 04:27.